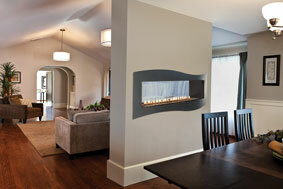 This customizable vent-free natural gas fireplace is a great way to add a contemporary look to your home. At 48 inches and 40,000 BTUs, this fireplace is large enough to heat a large portion of your home, and supplement your existing central heat, and with the millivolt pilot ignition, it can run without electricity in the event of a power outage and keep you and your family warm. The Empire VFLL48SP30LN Boulevard Contemporary See-Through Vent-Free Fireplace can be installed as is, or you can add an optional decorative front to give it a more appealing finish once it's mounted into the wall. While we do ship Empire fireplaces to Canada, ventless systems are not allowed in Canada. If you are looking for a see-through fireplace, I'd recommend any number of direct vent systems which are allowed in Canada, but please note that there will be additional freight charges for orders shipped to Canada. Does the Empire VFLL48SP30LN Boulevard see-through unit need to be installed by an authorized dealer? Will it require a city permit and inspection? This is for a new construction. To maintain your warranty, we would recommend having a licensed gas fitter (such as a plumber or HVAC technician) make the connection with the gas, including pressure and leak testing. The unit can otherwise be framed and finished with whomever you choose to have it done, if not yourself. Is there glass to encase the fire? Or, is it left open? Like most all ventless gas hearth systems, the open hearth may not be enclosed as it will draw in all combustion air from the home. There will be a pane of glass positioned just in front of the burner flame that is just tall enough to prevent accidental contact with the flame. Can this be used on an exterior wall? This unit would not be able to be installed on an exterior wall as the fireplace has no method to weather seal the exterior side of the fireplace.